While Toni Lotempio does not commit – or solve – murders in real life, she has no trouble doing it on paper. Her lifelong love of mysteries began early on when she was introduced to her first Nancy Drew mystery at age 10 – The Secret in the Old Attic. She (and ROCCO, albeit he’s uncredited) pen the Nick and Nora mystery series from Berkley Prime Crime – the first volume, MEOW IF ITS MURDER, debuted Dec. 2, 2014. Followed by #2, CLAWS FOR ALARM . #3, CRIME AND CATNIP , was released in December. I'll start with the characters. They are Deeee-lightful. Syd is a smart character, that I instantly could see as an actual person. She's flawed but not overly so. Her sister and friends have vivid personalities too, no question about that! If I had to pick someone that I wasn't super fond of, I'd definitely say it's gotta be Will's partner. He was just annoying, although he did have a fondness for good desserts which I can't really fault him in that! The real star though, was Toby the cat! I want that cat in my life super muchly! His personality was awesome! 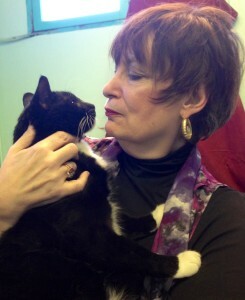 To top it off, he's also a friggen hero, which makes me love him and want to adopt him (Sorry Syd!) even more! All-in-all, this was a great read. I was surprised, I was entertained, and I was delighted thoroughly! Definitely pick this one up! Loved the Nick and Nora series. I'm sure this series will be just as good. 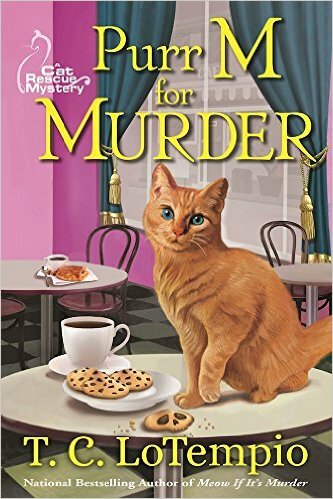 Can't wait to read "Purr M for Murder".